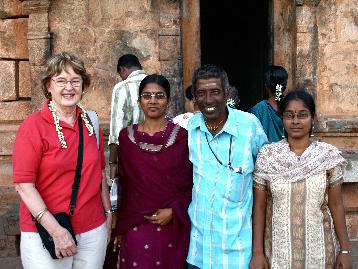 Tanjore, as everyone said for the benefit of us western tourists, is probably the city we liked most on this trip. It's small enough but not too, quite clean and neat for an Indian city, lively and of course friendly. 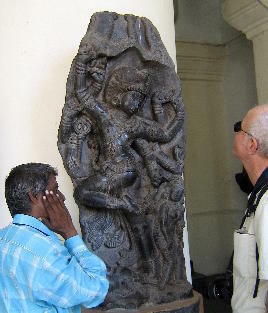 Not only that, but we were shown Tanjore by Raja. And it is his city. So now a word about Raja, the wonderful guide who was with us in Chidambaram, Gangaikondacholapuram, Darasuram and Thanjavur. 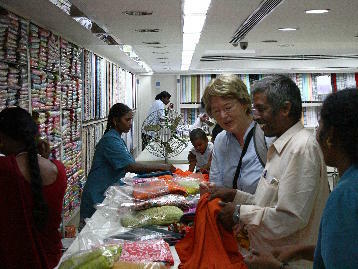 Raja is a wonderful guide and a wonderful person. He not only guided us through these sites, he also preached (in the good sense), danced and sang us through them. And above all, he shared his love of all this beauty and his cheerful but deep faith. What more can one ask? More later about Raja. 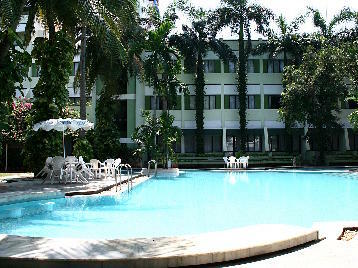 It also helpled that we had the best hotel of the tour, the Hotel Parisutham, which we recommend highly. It happened to have a wonderful swimming pool which, for some reason we never understood, was always empty -- except for me (John)! 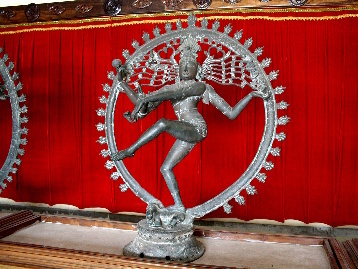 We started out by visiting the Royal Palace, which houses the Thanjavur Art Gallery and its magnificent collection of bronzes. They are indeed wonderful, even better than those in the Government Museum in Chennai, in our estimation. 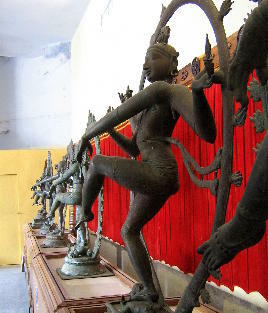 More pictures of the Thanjavur bronzes can be found in our gallery. 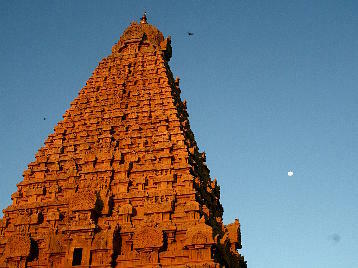 The other thing one must see in Thanjavur is the Brihadishwara Temple. We visited it twice. 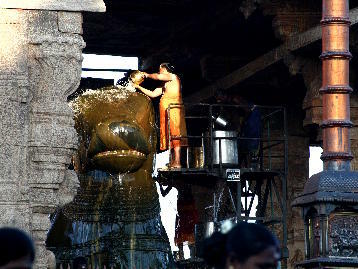 The first time was in the evening, for a Nandi Festival. 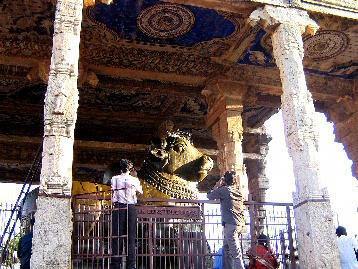 Nandi is a bull and is the mount of Shiva. For the evening, he was adored by being washed with various sacrificial substances. Note that Nandi's tongue is out, as if to lick his nose. 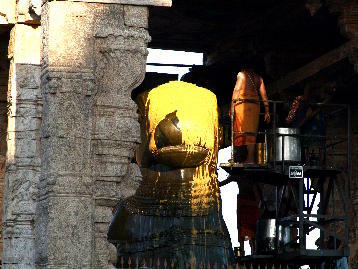 By now, the setting sun was bathing the sikhara of the temple in a gorgeous golden light. We walked all around it and enjoyed the evening cool and light. As we were leaving, we met Raja's daughters, who had come for the ceremony. Of course, they spoke perfect English. 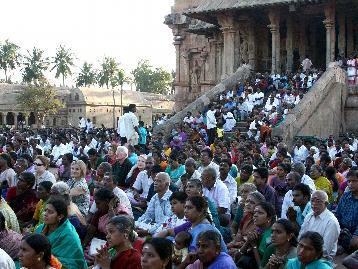 But further touring in Thanjavur had to wait for our second day in Thanjavur.